A common question our customers ask is “How much decking do I need?” so we built a simple composite decking calculator to help give our customers an idea of how many boards they will need to purchase to finish their project. To use the calculator simply select between M² or Ft², and input the area of decking you require, then click ‘calculate’. To purchase the amount shown simply click ‘Add to cart’ then go to your cart in the top right of the window and follow the instructions shown to checkout. Each project is unique and yours may also require joists, fixtures, fascia boards or corner trims. The calculator will also recommend a number for each of these optional products and give you the option to add them to your cart too. You may also change these quantities by pressing the "+" or "-" symbols before adding them to cart. We recommend adding an additional 5% of materials for off-cuts and wastage. For diagonally aligned boards we recommend adding an extra 15% materials. You have chosen . You will need x 2.4m Lengths. 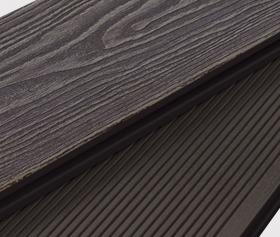 Dino’s composite decking boards are available in eight colours: Savanna, Amber, Cedar, Mocha, Silver, Ash Slate, and Graphite. 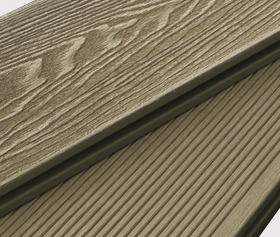 Order your FREE sample pack that comes with all eight colours to compare them by eye and get the decking colour that matches your dream outdoor space. Dino’s composite decking is good for the environment too - backed by our FSC and REACH certification. 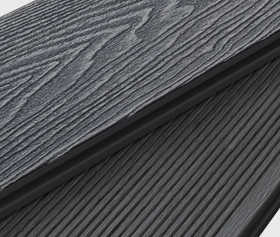 Our composite boards are made out of recycled wood and plastic, rather than chopping fresh timber, so you can look at our your new outdoor area knowing you’ve done a bit to help the planet. 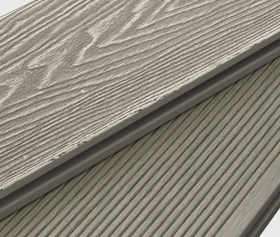 All Dino Decking is also covered with a 10-year warranty giving you additional peace of mind and ensures your top quality finish endures. 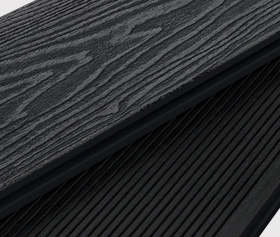 Dino decking composite boards are constructed from 55% recycled wood, 40% HDPE and ~5% additives. The composition of Dino decking boards can vary slightly for each colour due to the composition of additives used to create the colour. All colours come in 2.4 meters or 4m long boards, but can easily be cut to custom sizes for your project with standard carpentry tools. Composite boards are not directly screwed into the joists unlike traditional wood decking. They are secured using hidden fasteners that leave you with a clean and tidy finish. Installation can be done by a tradesman or confident end user. Click here to view our installation guide.